This article was originally posted on Travel Daily Media. 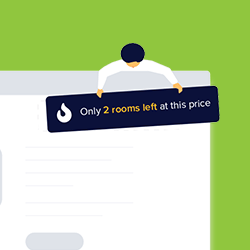 The Competition and Markets Authority revealed in a recent investigation that a variety of travel websites have been making ‘misleading claims about discounts and offers’. It also revealed that some travel websites have given customers false impressions of hotel room availability, ‘pressuring’ customers to make rash and quick decisions when it comes to making a booking. These pressures can lead to customers feeling dubious and overwhelmed, which can ultimately lead to them being put off booking a holiday and a deferral when making a purchase. If websites display fake information, customers could question the transparency of the website, which can result in an increase of distrust in the company – leading to a drop in overall conversion rates. Even though they can be persuasive notifications can be used inaccurately, it’s not to say that they should be avoided. When used accurately, travel websites can utilise appropriate persuasive notification tools, preventing a loss of trust and therefore helping business conversion rates to continually increase. As this can have a significant impact for many companies, the the implementation of persuasive notifications shouldn’t be dismissed by travel brands. Due to notifications being driven by trusted third party plugins, this helps websites rebuild their trust with visitors, in a similar way to logos being used for secure payment processing. Due to holidays being a huge spend for many people, customers often require reassurance and trust in a website or company before they commit to ‘giving away’ a large sum of money. 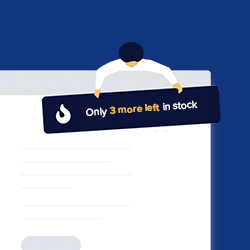 If websites provide persuasive marketing techniques, that for example, allow notifications to pop up to a customer whilst they are wavering whether to purchase or not, their attention is automatically drawn to that notification, instead of the rest of the page. These persuasive marketing techniques can be anything from creating a sense of urgency to buy, or generating an impact with scarcity – urging visitors to place a higher value on purchasing a holiday, due to a certain time limit being put on hesitant buyers. As with any travel website, the importance of the star rating has a significant impact in helping visitors decide which travel website they consider ‘the best’ or ‘most reliable’ when it comes to purchasing a holiday. Having a variety of reviews backing up the reliability or rating of a travel website can help make a holiday seem more desirable for visitors, as they can feel it is trustworthy. It also acts as a positive visual clue which helps to reinforce a sense of ‘making the right decision’ when it comes to customers making the final purchase. Placing star ratings and honest customer reviews in prominent places provides an added seal of approval for some websites and any additional persuasive copy underlining the quality and experience of the website can help better business practice in a non-manipulative way. As with any product, visitors always like to feel confident when making a purchase. Ultimately, for most businesses the more confident a customer feels, the more likely they are to purchase. This effect is referred to as ‘Information Bias’, which relates to how travel websites can help to ensure customers are making a well informed decision, even if some of the information included within the holiday isn’t relevant to them. Through the implementation of information bias, travel websites can be certain that their customers feel secure and happy with a purchase from the details of the holiday included. Real-life images, provided at different angles, or even a video of the destination/hotel can help customers feel more informed – ultimately making sure the travel websites business practice is reliable and trustworthy. If visitors are faced with ambiguity during the purchasing process they will soon be put off. Travel websites that provide clear and concise information and avoiding any use of vague information or text around offers or availability can help reassure any visitor. For websites to pinpoint any areas of confusion and to ensure they fix any problems immediately, they should implement regular processes for user testing. This can either be done through surveys that will pop up after someone purchases a holiday, or by asking those in the company not involved in the website to go through sales funnels and identify the points where something is unclear or concerning. Social proof is taken from a perspective that humans are driven to conform and are always influenced to copy other’s actions and decisions, when they are unsure of their own choices. Through social media networks, travel websites can show their followings or mentions from customers – which can help spark a rise in conversion rates, as more customers may feel as though they can rely the website. By nurturing its social media followings, travel websites business practices can be changed for the better and positively influence customers judgement of its website. Through the use of fake information, text and numbers this can lead to a travel websites business practice being manipulative and not a tool of marketing in any form. 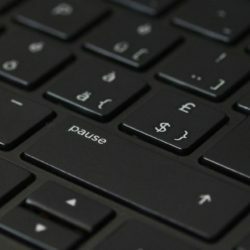 With the recent travel website scams, it is now essential for websites to implement accurate and honest persuasive techniques into its online platforms. Rather than adopt seemingly manipulative practices, travel websites should look to provide notifications that include information on the availability or scarcity of the holiday. It also helps to provide a reassurance of payment/reviews for visitors before purchasing. With this being key for travel websites to change their business practices, they can also implement tools to increase post-purchase satisfaction for their customers, ultimately creating a better website and company overall. 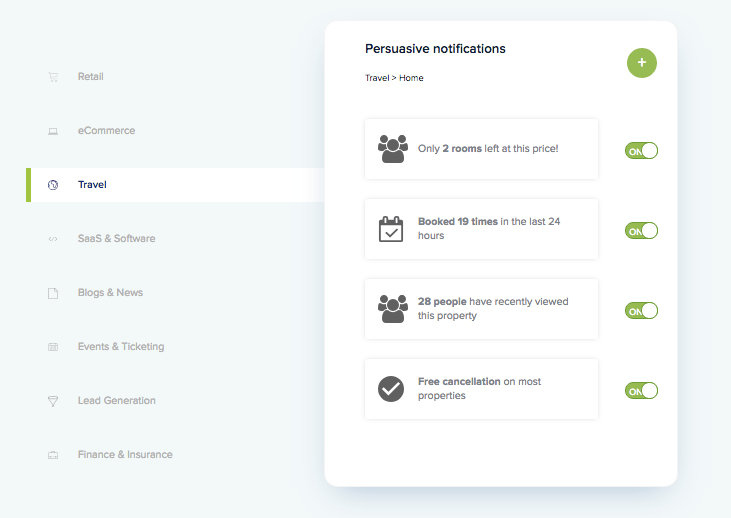 Want To Learn More About Persuasive Notifications? Read more about Social Proof, Scarcity and Urgency in our blog. And if you’d like to add persuasive notifications to your own site, why not take a free 30 day trial of Convertize. 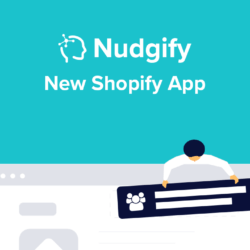 For those with a Shopify Store, it’s even easier, just download our Free Nudgify App!.